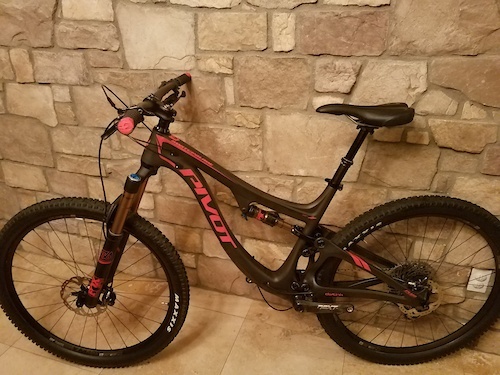 2019 Yeti SB130, size large, XX1 kit. Upraded XTR Trail Disc brakes and NOX carbon wheels with Industry 9 hubs. Super bike! Close to new condition, slight normal marks from riding! 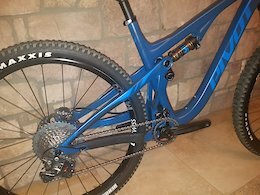 FRAME 2019 Yeti SB130 TURQ Carbon 29, 130mm, 12x148mm FORK	Fox Factory 36, 150mm REAR SHOCK	Fox Factory DPX2 HEADSET	Cane Creek 40 Inset SHIFTERS	SRAM XX1 Eagle REAR DERAILLEUR	SRAM XX1 Eagle CRANKSET	SRAM X01 Carbon Eagle 30t, 175mm BOTTOM BRACKET	SRAM DUB BB92 PEDALS	N/A CHAIN	SRAM XX1 Eagle CASSETTE	SRAM 1299 Eagle 10-50t BRAKES	XTR Trail WHEELSET	NOX Carbon Teocalli, Industry 9 Torch Hubs, Bladed Spokes FRONT TIRE	Maxxis Minion DHF 2.5 REAR TIRE	Maxxis Aggressor 2.5 HANDLEBAR	Race Face Next 35mm, 760mm width STEM	Race Face Turbine 35, 50mm length GRIPS	NOX lock on SEATPOST	Fox Transfer Factory SEATCLAMP	Yeti SADDLE	WTB Volt Titanium Thanks for looking! I accept Paypal. Shipping is $50 to US. ENVE 29er M60 Forty HV Boost Carbon Wheels DT Swiss 240 6 bolt hubs. Wheelset is in great shape with the XD driver (can swap for a shimano driver if needed). These are the HV rims! Boost spacing, 110mm front and 148mm rear. Normal small marks from riding. Thanks for looking! I accept PayPal, shipping is $30 to the continental US. Pivot Trail 429 size Large, new model. Pro XT build kit. In new condition, no scratches, etc!! Frame Material	carbon fiber Suspension	DW-link Rear Shock	FOX Factory Float DPS Rear Travel	120mm Fork	FOX Factory 34 Front Travel	130mm Headset	Pivot precision sealed cartridge Shifters	Shimano XT, 11-speed Rear Derailleur	Shimano XTR, 11-speed GS ISCG Tabs	ISCG-05 Crankset	Race Face Aeffect SL (30 t) Crank Arm Length	175mm Bottom Bracket	PF92 Cassette	Shimano XT M8000, 11-speed (11 - 46t) Brakeset	Shimano XT M8000 Brake Type	hydraulic disc Rotors	180mm Handlebar	Phoenix Team Carbon, 35mm clamp Handlebar Width	760mm Grips	Phoenix Team Padloc Stem	Phoenic Team Enduro 35mm clamp Stem Length 55mm Saddle	WTB Vigo Pro Seatpost	125mm FOX Transfer Seat Collar	34.9mm Wheelset	DT Swiss M1700 (30mm width) Hubs	DT Swiss with 36t star ratchet upgrade Front Axle	15 x 110mm Boost Rear Axle	12 x 157mm Super Boost Tires	[front] Maxxis Minion DHR II (TR/3C/EXO/MaxxTerra), [rear] Maxxis Rekon (TR/3C/EXO/MaxxTerra) Tire Size	[front] 29 x 2.4in, [rear] 29 x 2.25in Thanks for looking! Shipping is $60 to continental US!! 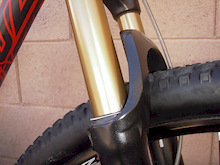 Pivot Firebird 29er Pro XO1 build. 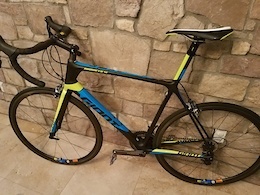 Super bike, close to new condition, barely ridden! Size Large. Pivot Firebird 29 Pro X01 Bike Frame Material	Carbon Fiber Frame Material Details	Ultra-light full carbon frame featuring hollow-core, high-compression carbon molding with full-length internal cable routing Rear Travel	162mm Rear Shock	FOX Performance Float X2 (metric) Fork	FOX Factory 36 Grip 2, 44mm offset Fork Travel	170mm Head Tube Diameter	Zero stack 49.6mm top, zero stack 56mm bottom (also accepts a standard 1.5 external top cup) Headset	Pivot Precision Sealed Cartridge Handlebar	Phoenix Team Carbon, 800mm Stem	Phoenix Team Enduro, 35mm diameter clamp, 45mm length Grips	Phoenix Team Padloc Brakes	Shimano XT M8020 4 piston Brake Levers	Shimano XT Drivetrain	1x Shifters	SRAM X01 Eagle 12-speed Front Derailleur	N/A Rear Derailleur	SRAM X01 Eagle 12-speed ISCG Tabs	ISCG05 Chainguide	Top guide Cranks	SRAM X01 Eagle with OneUp SB+ Switch Spider, 170mm Chainrings	32 tooth Bottom Bracket	Pressfit BB92 Pedals	N/A Chain	Cassette	SRAM X01 Eagle, 10-50 tooth, 12-speed Rims	DT Swiss 29 M1700 wheels, 30mm width Hubs	DT Swiss 350, 36 tooth star ratchet upgrade Spokes	DT competition straightpull, 28 front and rear Tires	Front: Maxxis Minion DHF WT 29" x 2.5" TR/3C/EXO/ MAXXTERRA Rear: Maxxis Minion DHRII WT 29" x 2.4" TR/3C/EXO/ MAXXTERRA Saddle	Hightail Trail Pro Seatpost	FOX Transfer, 150mm Thanks for Looking! Shipping in $60 to continental US!